I'll start: I've got a 1989 Toyota van 2WD LE, gasoline, 4 cyl, and I get 21-22mpg in town and 24-5 or so on a long highway trip. Speed doesn't matter for any of these numbers, it gets what it gets. 2010 2.5L CVT Subaru OB our trip this week was with the 4x6 lifetime tent trailer + two parents bikes on the roof in fork mounts with 30inch wide 7ft long roof box between the bikes on 54inch bars + two kids our trip average was 19.5mpg. Similar trips without the bikes on the lid we saw 21-22mpg. No roof rack gear or trailer we typically see trip averages of 28-32mpg. Around town we get 23-24mpg. 2007 Toyota Sequoia Limited 4.7L (stock sized BFG Rugged Terrains) our trip this summer over a 9000ft pass with 14-26% grades pulling the LifeTime Tent Trailer 5 passengers and gear we were averaging 14mpg for the trip. No trailer road trips we typically get 17mpg. Just for the hell of it Grandpas 2005 SLK350 which the wife and I are taking next week on a two day trip we typically see 28-30mpg averages as long as we keep it under 85mph. The old 93 Land Cruiser we never got better than 13mpg and the worst was 10mpg didn't matter what we were hauling or towing that was what we got with 285 BFG's on it. 2005 sprinter 2.7L diesel. 25 mpg combined. 1996 E350 Class III Road Rescue Ambulance, 2wd, 7.3L Powerstroke Turbo Diesel. No lift with road tires. 12mpg combined. 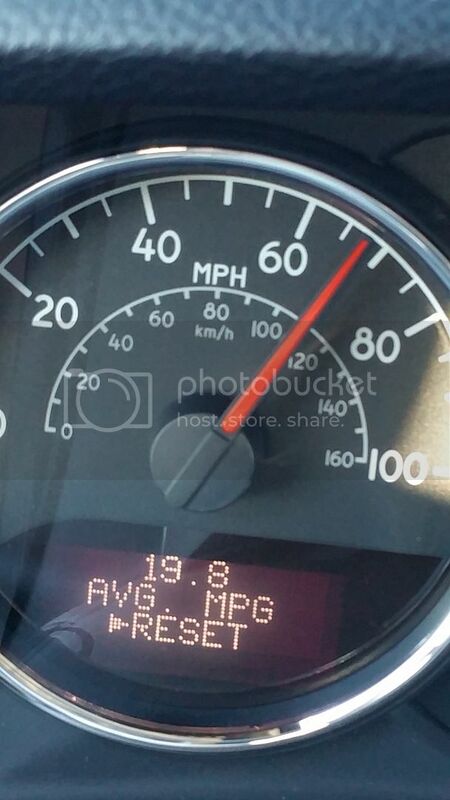 Relatively stock 2015 Jeep Wrangler Unlimited Rubicon - 17.5mpg combined average. coming back from AZ, driving thru AZ and New mexico with trailer 19.8, don't know how that happened, only thing I can contribute it to is altitude? The computer, but also hand calculated and it is right on. 10 to 13 mpg depending on fuel blend (winter/summer), and alcohol content. As long as I keep it around 65 fuel consumption is reasonable and 50 gallons of fuel keep stops to a minimum. Haha. Nice!! That sounds about right.